279 days until Cassandra Clare’s Queen of Air and Darkness hits book shelves (Dec. 4) and concludes her The Dark Artifices trilogy! A ghost, Kit thought. Like Jessamine. He looked around wildly: surely there would be more ghosts here, their dead feet leaving no traces on the grass? But he only saw the Blackthorns, clinging together, Emma and Cristina side by side, and Julian with Tavvy in his arms, as the smoke rose up and around them. Half-reluctantly he glanced back: the young man with the dark hair had moved to kneel beside Robert Lightwood’s pyre. He was closer to the flames than any human could have gotten, and they seemed to eddy within the outline of his body, lighting his eyes with fiery tears. Parabatai, Kit thought, suddenly. In the slump of the young man’s shoulders, in his outstretched hands, in the longing stamped on his face, he saw Emma and Julian, he saw Alec as he spoke about Jace; he knew he was looking at the ghost of Robert Lightwood’s parabatai. He didn’t know how he knew it, but he did. Nooo – why? 😥 Damn both Cassies! What do you think of this snippet? Sound off in the comments below! 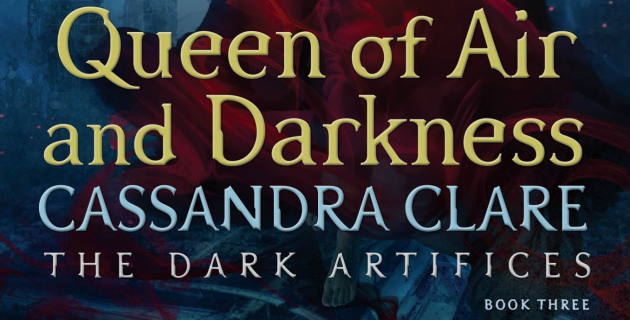 Queen of Air and Darkness is published on December 4.
oh i love this! ❤ I was sad when I read it, picturing Michael not 'moving on' all these years. I hope they're both at peace now. The illustration is super sweet and nice to picture reconciliation after death. Before the illustration I wasn't sure Michael would move on even after Robert's death, but now I feel like they've both moved on together. damn…i am crying. they finally met and forgive. Does this mean Jem would see Will when he dies ? ?